entrenched in what has become “modern” (read: RWS clone that is just a pretty face) Tarot, but rather giving us a set of cards that reveal so many mysteries of symbolic systems that have informed the development of card meanings that I nearly wept with joy. Never before have I seen the Kabbalistic system of the Minor Arcana presented so succinctly, beautifully, powerfully and accessibly in a Tarot deck… not even in Crowley’s Thoth. There are some decks that are great for divination. The Mary-El Tarot is not one of them. This is, perhaps, it’s only downside. But it leads directly to what is one of its greatest strengths: this isn’t just a fortune-telling deck, it is food for the soul. Not only in the artwork itself, but in the companion book, which adds to the reader’s understanding of the cards as well as their understanding of the universe. This might go some way to explaining the companion book’s title, as it really is a guidebook to the “Abyss” – the darkest recesses of the human experience. Now, one might be forgiven for looking at the Mary-El Tarotand judging it immediately as a “dark” deck, or even a “gothic” deck. It is neither of these things, however. 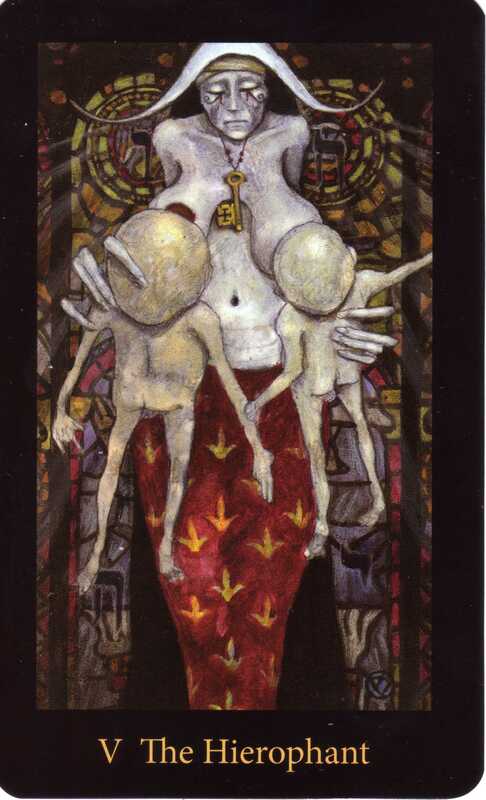 The artwork is only dark in as much as it is rich, and does not hold itself back, creating at times quite disturbing images (V The Hierophant being the one that does it for me). The theme, despite the abyssal language and heavy black card borders, card backs and the box and guidebook colouring is not in any way “dark”, but perhaps heavy for those who are not briefly familiar with Kabbalah and the fact that the cards are called “Arcana” for a reason. The Mary-El Tarot is a standard 78-card deck with scenic Minor Arcana, numbering in the Marseilles tradition (VIII Justice and XI Strength) and RWS Major Arcana titles. It uses the Thoth’s suits (Disks rather than Pentacles or Coins), but the RWS Court Cards of Page, Knight, Queen and King. It is far larger than your average deck, (14cm by 8.5cm) which is a nuisance for small hands but a blessing for the artwork on the cards. (Tip: shuffle the deck vertically rather than horizontally.) Each card has a thick black border around it with titles in the border beneath, and the card backs show a double ouroborous in the shape of two interlocking circles (or a vessica piscis). The card stock itself is sturdy, with a high-gloss finish, meaning the deck will last a long time. It comes packaged in a magnificent box with magnetic sealing and a flip-top lid, along with the 192-page companion book. The only disappointment with this deck for me came with the printing itself: several of the cards in my copy of the deck have the images printed more to one side of the card, leaving a wider border width on one side than the other. However, it took me a number of viewings to stop being so enamoured with the card images that I noticed this. 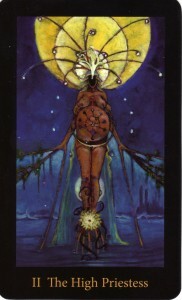 The Mary-El Tarot has achieved what I see as the “redemption” of the Fives and Sevens – no longer the arbitrary meanings of “loss” and “grief” for the Five of Cups, or “financial loss” for the Five of Coins. There are deeper messages in these cards than this, but they do not lose their element of challenge and suffering. In fact, where some modern decks have made the more negative cards lighter or gentler, changing perspective to soften their blow, the Mary-El Tarot deepens every single card. Suddenly the gap between Major and Minor Arcana does not seem so wide, and the Divine is present in everything, informing every detail and holding it all together. When it comes to the Court Cards, the Mary-El Tarot simply excels. These aren’t just people cards anymore, and gone are the readings of “I see a bitter, widowed woman” or “a tall, dark, handsome stranger”. Of course these cards can still represent people, but the Mary-El Tarot makes it clear that these cards are also about states of being, perspective, mind, and action, as well as environments, acts and possibilities. These Court Cards open up like sixteen landscapes filled with many potential roads and paths, labyrinths and symbolic highways. The explanation of the Court Card system in the companion book is also concise and accessible, making the Mary-El an excellent deck for anybody wanting to get to grips with the Tarot Court. The detail on every single card of the Mary-El Tarotis astounding – not just aesthetically and technically, but symbolically. Look really carefully and you’ll see planetary sigils and angelic sigils half-hidden on archangels and beasts, or clever and meaningful interplays of symbols between cards. For instance, the green gem stolen by the raven Munin in the Seven of Swords appears as the Queen of Swords’ eye and links the card to Odin. Look closely and you’ll see Eve’s pale hand in the Five of Swords held by a darker hand – surely this is the hand of Adam, depicted in the Five of Coins? Some of the mysteries contained in the card images and symbols are revealed in the book, such as the inscriptions surrounding the gateway in the Eight of Swords, but there are many symbols and images that are not explained fully. This leaves you room to embark upon a journey of discovery yourself, as well as to intuitively come to an understanding of how the cards relate to your own Self and experience of the Universe. 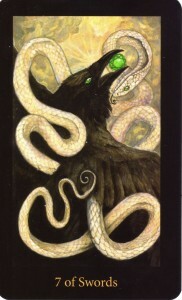 This isn’t a simple deck, though at first some images may look so (such as the Seven of Wands, which simply depicts the face of a white wolf with vivid green eyes, facing the reader), but instead reveals its many layers and probably some of your own with repeated visits. The companion book, “Landscapes of the Abyss”, reads like a delicious heresy, mixing in ancient Sumerian influences, ancient Egyptian, Kabbalah, Gnosticism, Christianity, angelic symbolism, later occult symbolism, alchemy, and more. 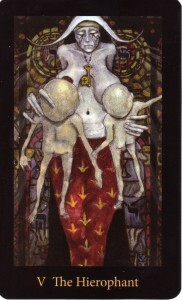 Certain card descriptions may not sit well with those entrenched in traditional Christian religion, in particular the Hierophant, in which we find the Whore of Babylon. (Interesting note: the earlier Majors-only 2003 edition had the illustration now in the Star card as the Hierophant, with the Star an illustration that has been discarded from the finished deck entirely.) The book itself would be worth it alone – it is a wonderful exploration of the human soul and its various evolutions, challenges, opportunities and states, and Marie writes about the cards in a way that is breathtakingly beautiful and full of wisdom. That, I think, is what Marie has done. Whilst it might seem to denigrate the artist’s talent, it is not meant to, when I say that somehow this isn’t just Marie in the cards (yet it is also wholly Marie.) 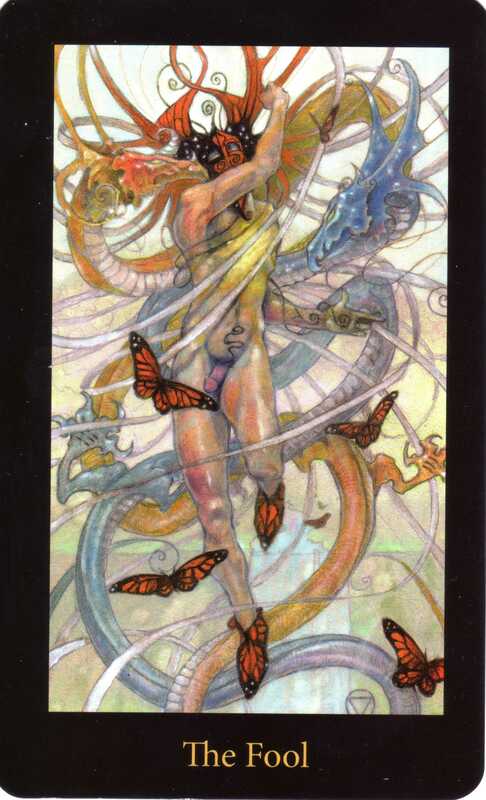 Something bigger than the artist shines through the deck in the same fiery, passionate way that the flames of divine inspiration explode and flow around Joan of Arc in the Page of Wands. 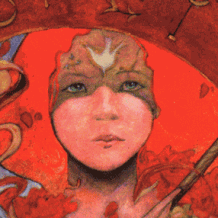 The Mary-El Tarot is not a beginner’s deck… and thank the Gods for that! But it is a deck that will continue to feed your soul for a lifetime, a deck that presents the mysteries of the Universe condensed down into 78 images, with a coherent and inspired system that not only utilizes the traditional Kabbalistic and numerological systems of symbolism but also presents a system unique to itself. It does require a bit of Tarot knowledge to use it, and I would definitely recommend studying the companion book and Kabbalah to make the best use of this deck. 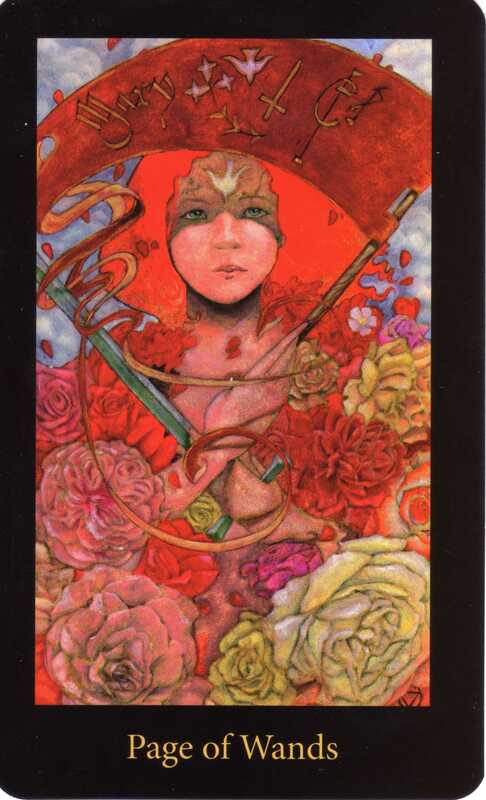 The Mary-El is the deck I’ve always been waiting for, a treasure for any collection, a shining beacon in the Tarot world that has raised the standard for modern Tarot decks signficantly. An exceptionally well done review that addresses some of the central creative innovations of this instant classic deck that should become part of any tarotist visual symbolic mythic frame for entering the mysteries of self-other and world. Bravo! Great review. The same for me, I’ve followed the creation of this deck by the blog of Marie White. Thanks internet for that. And I still am overwhelmed by the power this deck gives me since I held it in my hands. The only thing I disagree about is that it is not good for divination. It is. You only need to forget a lot you have learned about RW or Crowley and look the images and connect with it. That will take some time and dedication.